Trust us to bring a laid back attitude to stylish relaxing. 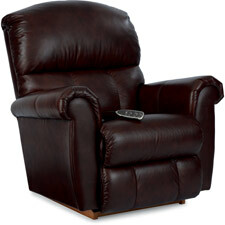 The Briggs leather power recliner is the perfect combination of cool and comfortable. Enjoy full reclining comfort with virtually limitless reclining positions all at the touch of a button thanks to an independently operating back and legrest. Generously cushioned with soft shirring on the back and footrest, and a chaise seat for full body support.